NX1 compact controller for machines. UK manufacturing is struggling to boost productivity and to improve quality. A flexible production line is a key for the next manufacturing processes. Hence, the use of high-end multi-functional machines is one solutions. The NX1 entry level compact controller brings this level of performance to compact machines. Its electronic cam and interpolation increase machine speed and precision. Moreover, this brings together improvements in productivity and quality. 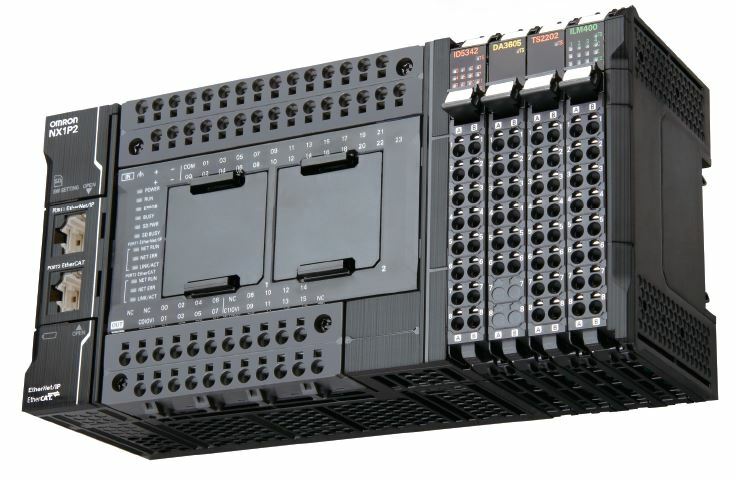 It integrates EtherNet/IP and EtherCAT connectivity, motion control and I/O in one device. Data from remote devices, collects via the EtherCAT. The data then moves between machines via the built-in EtherNet/IP port. Notably, the EtherCAT synchronizes axes control, remote I/O and safety devices within 2 ms cycle time. The networks work together providing fast real-time machine control and data plant management. In so doing, they help predictive maintenance and full integration, reducing machine downtime and increasing productivity. The Sysmac automation platform and NX1 provide a total solution for small machines. It includes motion control of up to 8 axes, while integrating function like safety and vision. The resulting solution simplifies machine installation and wiring. The Sysmac Studio software integrates programming, monitoring and diagnostics of all machine devices. It reduces engineering and debugging time. One machine control through one connection, and one software is Omron’s approach. As a result, Sysmac offers a machine automation controller platform. it combines logic, motion, safety, robotics, vision, information, visualization and networking are under one software. Sysmac Studio is an integrated development environment, including custom 3D motion simulation tool. Hence, it make designing and debugging easier. Overall, this simplifies remote maintenance by monitoring devices connected via EtherCAT through the NX1. 999Automation has teamed up with Omron. Firstly, we have created some special motion and position control kits for your compact machine. Secondly, by purchasing a kit now, you get a free technical training from Omron’s motion control experts at their Milton Keynes office.